Donations are now being accepted for the upkeep and support of Newf-Net. All donations are graciously accepted, and will be put entirely into the upkeep and maintenance of the Newf-Net server. Some things that the donated money would be used for are listed below. 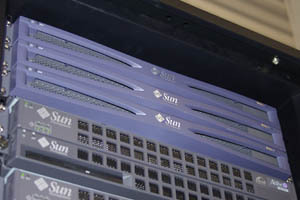 For those wondering, Newf-Net and GAD.net run on a Sun X1 Running Solaris. 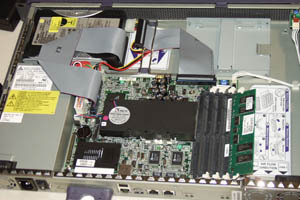 The actual server is shown mounted in it's original home on the right. Another pictures of its innards (It has been updated since this image was taken) is shown below. Sometimes a server may need more disk space, a faster processor, a new power-supply and so-on. This is generally in the event of a critical or impending failure, though it can be something like needing more memory to support a newer version of software. The software that the Newf-Net forums run sometimes needs to be upgraded, or perhaps support needs to be engaged. This includes only things that are related to Newf-Net, including the base operating system (Solaris) and the Newf-Net forums (UBB). Software should be upgraded from time to time, and donations would be used to that end. Under no circumstance will donations be used for any software other than that needed or used by Newf-Net. For example if I decide to put up a page to sell photographs and need e-commerce software, that's my problem, and will not affect the Newf-Net donations in any way. Supporting a server in a location with large amounts of available bandwidth, physical security, fire suppression and 24x7 backup power costs more than putting a PC under my desk at home. The benefits are that the server will not go down when the power fails, if there's a fire it's protected, the kids can't pour apple juice in the USB ports, and it stays cool (There's no AC in my house). The cost for doing this is about $100 per month. This is not tax-deductible. I'm not non-profit or profit or anything. I'm not an organization. I will post a page showing all expenditures made from the donated money. The money will be kept in a separate checking account, which I will use solely for Newf-Net needs. No guarantees are made as to the use of the funds other than as listed above. Donation does not imply any status or privilege for the donor. A record will be kept of every donor and their donation, but this list will be for my use only, and will never be made public. All names, emails and donation amounts will never be distributed, sold or otherwise made available to anyone outside of myself, or possibly my wife. Please - do NOT make donating to Newf-Net a priority above anything else except maybe buying beer. Ok Good beer has its priority too, but that's it. Please do not feel bad if you can't afford a donation. Please put yourself and your kids and your pets before Newf-Net. Please don't forget your local shelters and Rescue organizations. They could probably use the money better than I can, and they could probably use labor too, which is even cheaper!